Charlie Heaton and Millie Bobby Brown wear black and white high top Converse “Chuck Taylor” All Stars in the series. Natalia Dyer wears navy blue low cut Converse “Chuck Taylor” All Stars in the series. Eleven walks into the boys’ school wearing chucks. A lost boy with a mother who won’t rest until he is found, a government lab steeped in terrible secrets, and a group of friends willing to venture into the unknown to rescue their friend. The latest Netflix hit Stranger Things will have you hooked with its intriguing and suspenseful plot, and excellent 1980’s sci-fi vibe. Will’s brother Jonathan wearing a pair of chucks in his room. In a sleepy Indiana town, things begin to go awry when young Will Byers (Noah Schnapp) goes missing. His mother Joyce (Winona Ryder) and the local sheriff, Jim Hopper (David Harbour), search for him uncovering some dark secrets about the local government agency, Hawkins Laboratory. Meanwhile, his friends Mike (Finn Wolfhard), Dustin (Gaten Matarazzo), and Lucas (Caleb McLaughlin) search for Will on their own, coming across a young girl with psychic powers called Eleven (Millie Bobby Brown). This search will lead all of our characters down a road that few have ever come back from into dangers that are absolutely terrifying. Jonathan picks up the pieces of his camera in the school parking lot. 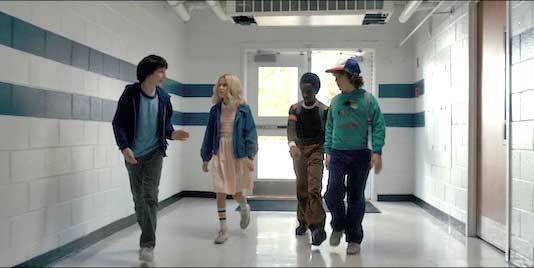 Set in the 1980’s, Stranger Things features a few of its main characters wearing chucks throughout the eight episode Season 1. After receiving a makeover from the boys, Eleven can be seen wearing a pair of white high tops. 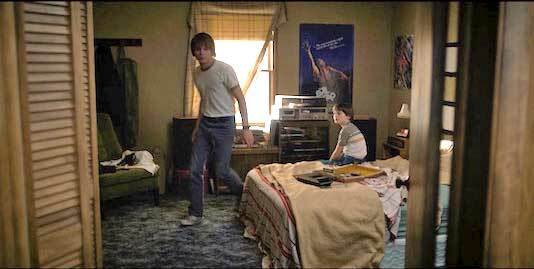 Will’s brother, Jonathan (Charlie Heaton), wears a pair of all white and a pair of black chucks in two separate episodes. Mike’s older sister Nancy (Natalia Dyer) wears a low top blue pair. Be sure not to miss an episode, as every single one is great and plays into the season long story, sprinkling in clues, references, and easter eggs throughout. 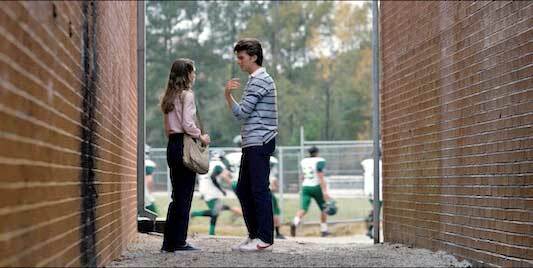 Nancy and Steve discuss what’s been happening in Hawkins. Stranger Things was a certified pop culture phenomena when it was released back in July, and it’s easy to see why. The show is completely different yet oddly familiar at the same time. Paying tribute to the sci-fi movies of yesteryear while establishing its own identity, this show will capture you and make you wait on the edge of your seat for Season 2 to premiere in 2017. Eleven chilling in her chucks.